With the start of the new year came several new opportunities for me (Elizabeth) at work. On January 2nd I became the Group Lead for some of the ETHOS flight controllers, which are responsible for the environmental and thermal systems on the International Space Station, and on January 13th I started a sixteen month Mid-Level Leader Program (MLLP) within NASA! I'm truly honored and humbled to have both of these opportunities. This will be my third group of flight controllers to manage, which means I have had the opportunity to continue learning new technical information, as well as growing in my leadership skills and working with more amazing people. NASA's MLLP training has already proven to be an invaluable experience for both my personal and professional growth. There are 28 participants in this year's MLLP from across all of NASA's centers, and I get to be one of them! We all had to go through an interview process at Headquarters in Washington DC in November where each center sent several of their top mid-level leaders forward in hopes of being accepted into the program. The fact that I was on this list and had the opportunity to interview meant the world to me! I found out the next day that I was accepted into the program with a few other friends from Johnson Space Center, and we were all ecstatic! Everyone in the program got together in January for our first of four joint training sessions. Everyone in the group is amazing, and I'm so excited to get to spend this time getting to know them better and learn from them and the experts that are pouring into us! We spent most of this training session digging into who we are as leaders and figuring out how to stretch and grow to be better. We each have a mentor from a different NASA center to help us with this as well. This training session was at NASA's Stennis Space Center, and we got to spend some time one afternoon touring the center and some of the tenants that reside there, such as Pratt, Whitney, Rocketdyne. It was fun to see what they are working on, and being an industrial engineer by training, I was impressed with their manufacturing processes! The highlight of the tour though was getting to visit one of Stennis' rocket engine test stands. Some of the guys that work there gave us an incredible tour of the A-2 test stand! Here are a few pictures I was able to capture with my phone. 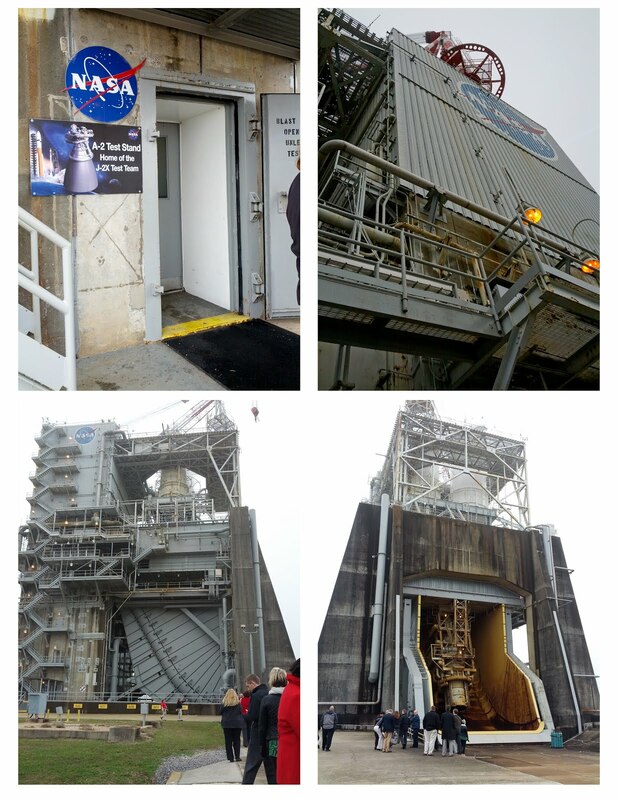 There are a few more pictures from the tour of the test stand in the album. The week we spent together in training was a non-stop, intense period that helped us to quickly form bonds with each other, but it also allowed us to step away from our daily lives to look closer at who we are and where we want to go. We were all exhausted emotionally and physically from the long hours and introspection when we returned home, but I can honestly say I feel like it was one of the best training experiences I've ever had. I'm excited to continue this journey! President's Weekend with the Tims!